MIAMI - Enduring wet and windy conditions, thousands of runners took to the streets of Miami and Miami Beach Sunday morning as the FitBit Miami Marathon rolled through the region. 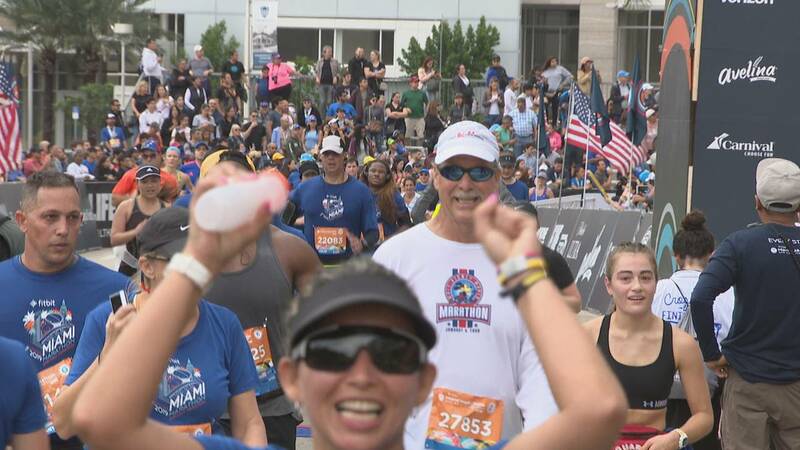 Starting at 6 a.m., the runners were cheered on by thousands of spectators who lined streets as the competitors wended their way across causeways and through downtown neighborhoods, finishing in Bayfront Park along Biscayne Boulevard. More than 21,000 people participated in the 26.2-mile trek through the Magic City. Organizers also hosted a half-marathon -- which included Local 10's own Will Manso -- and 5K race. Zein Aly came from Egypt to participate. "It's amazing. It's my 10th marathon and my second time in Miami," Aly said. The first male finisher of the full marathon was Kipsang Ezekial from Kenya with a time of 2 hours,16 minutes. The first female finisher of the full marathon was Kate Landau from Tacoma, Washington with a time of 2 hours, 37 minutes. The first male finisher in the half-marathon was Issac Mukundi from Grand Prairie Texas with a time of 1 hour, 6 minutes. The first female finisher of the half-marathon was Melanie Myrand from Canada with a time of 1 hour, 19 minutes.